To commemorate Force Friday 2016 – the day Star Wars: Rogue One toys are released for the very first time – Disney is releasing this awesome Star Wars: Rogue One Scarif Stormtrooper Vinylmation Eachez vinyl figure! 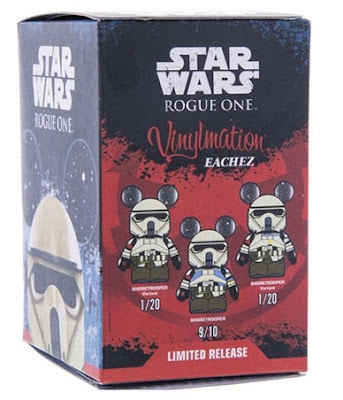 An Eachez release is when Disney releases just one single design blind box style with a very rare chase variant randomly inserted. 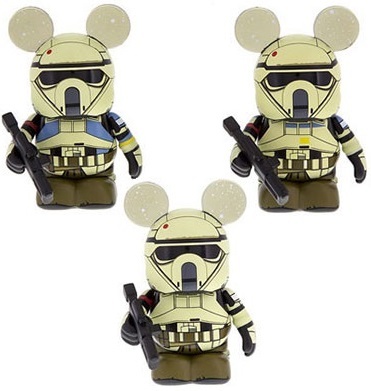 For this release there are actually three different Scarif Stormtroopers randomly inserted in blind boxes, each with a slightly different colored armor. The standard Scarif Stormtrooper is the most common with a 9/10 ratio, while the two variant Scarif Stomtroopers each have rations of 1/20. The Star Wars: Rogue One Scarif Stormtrooper Vinylmation Eachez Vinyl Figure by Disney stands 3” tall and retails for around $16.99. at DisneyStore.com.